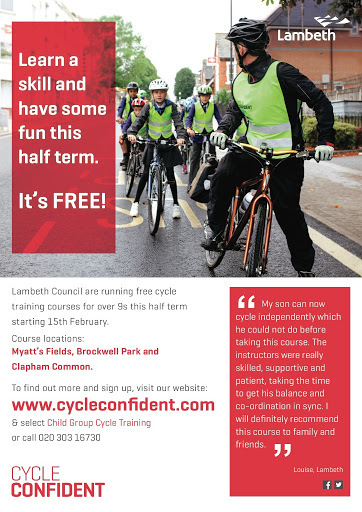 This half-term, 15-19 February 2016, Lambeth's cyle training provider Cycle Confident will be running courses for young people (age 9+) across Lambeth. The four day courses will run mornings and afternoons from bases in three Lambeth parks: Brockwell Park in Brixton, Clapham Common and Myatt's Fields Park in Camberwell. The training is road-based to Bikeability Level 2. The training is free for all young people who live or study in Lambeth. For further information and to sign up see the Cycle Confident website. Bikeabiulity Level 2 takes place on local streets, giving trainees a real cycling experience. Trainees learn how to deal with traffic on short journeys such as cycling to school or the local shops. Trainees are usually trained in small groups – up to 6 trainees per instructor – though individual training may also be available.